The DPU launched its first undergraduate module this month. Global Inequalities and Urban Development is offered through the Bachelors of Arts and Sciences (BASc) degree programme. It was developed out of a strand of the Global Citizenship Programme (GCP), UCL’s free summer school for current students. Course leader Stephanie Butcher explains. What motivated you to develop the module? Every year after the GCP we are approached by students curious to learn more about the DPU, and looking for further opportunities to look at some of these issues through the DPU lens. So, after we looked at what was on offer in other departments from UCL, as well as what kinds of programmes we might attract students from, this is what we came up with! What’s the GCP course about? The GCP course is called ‘Rise up! Negotiating urban change in Dar es Salaam’. It’s a two-week simulation of an informal settlement in the city of Dar es Salaam, Tanzania. Students are assigned specific roles within a set of actor groups, including groups of slum dwellers, NGOs, local government, local and central government, private sector organisations, or external donors and foreign investors. In their actor groups, students are guided through a process of negotiation and the development of strategic international, national, and local alliances, to help address the major social, political, and environmental challenges facing residents of Dar es Salaam's informal settlements. 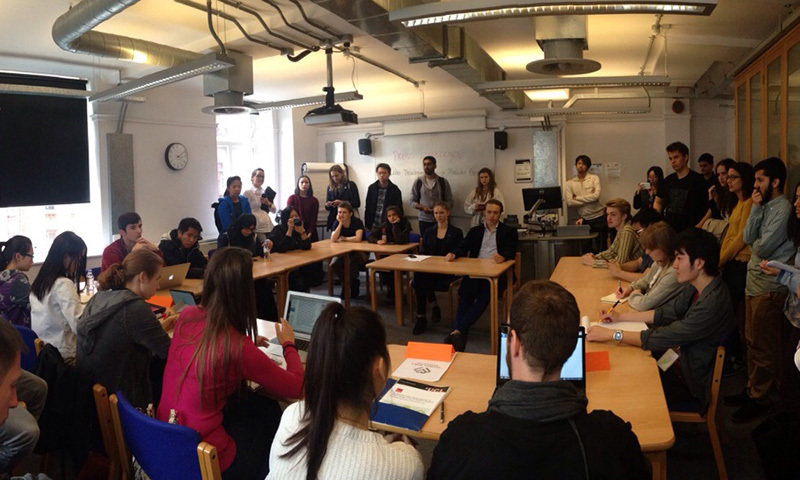 How did you develop the course for the UCL Global Citizenship Programme and how much it has changed in its morph into an undergraduate programme? Actually, the GCP course itself was originally based on an interactive simulation activity which the DPU runs for its Masters students. The 'Windsor Workshop' takes several hundred students each year to the Windsor Lodge for three days, where they use a real-life case study based in the Global South to explore the complexity of urban development issues, and especially how that impacts diverse people. We adapted the case study materials from this exercise to suit an undergraduate audience, and introduced some fictional elements to allow for a bit more flexibility in the scenario-building. The other core element of the course was a series of morning lectures which were designed to introduce students to key issues and challenges around sustainable development of equitable cities. The GCP course has influenced the design of the new module in a couple of ways. The key 'headline' conceptual challenges which we introduced (very briefly!) in the summer school programme are explored in a lot more scope in the new module. This means looking at the impacts of wider trends such as globalization, environmental change, and urbanization on inequalities, and especially how those inequalities are felt at the micro-scale in daily life. The other key characteristic is an emphasis on bringing these issues to life through practice. In the module, that means we take a case study approach to explore the issues. How does this aligned with Connected Curriculum (CC), UCL's initiative to advance research-based education? In general, the DPU is extremely active in merging practice and theory in our teaching, often bringing our own experiences in action-research into the classroom. This ethos is also present in the design of the new module, which is very much aligned with the principles of the CC around research-based teaching. The other key element of the course we're hoping to play with is taking a very reflective look at what it means to be 'in practice' in some of these cities with highly unequal sets of power relations. This necessarily means that students will have to go beyond engaging with theories or even case studies to think more critically about what their own role in a change process might be. How does the module sit with the portfolio of PG courses in DPU? This is the first time that the DPU has offered a module aimed at undergraduates, so it's still a new venture to be explored. DPU postgraduate students often come from a professional background, with a range of skills from architecture to planning to community mobilization, and of course that's not the profile of undergraduates, so we will need to adapt. Expanding our undergraduate offer would open up space for some of DPU's PhD research students in their final years to bring their own case studies and experiences to teaching, which I think is very exciting both from the undergraduate and PhD student perspective! The Global Citizenship Programme 2017, UCL’s free summer school for current students at all levels of study, runs from Tuesday 30th May to Friday 9th June. Registration opens in mid-February.